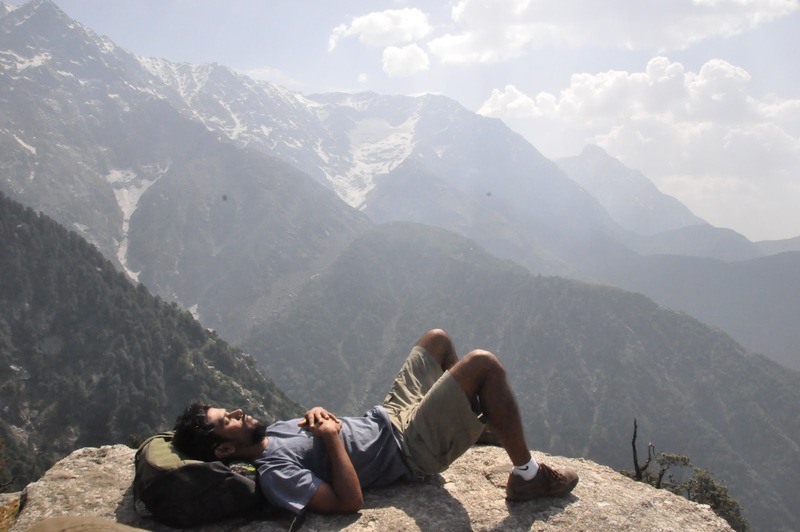 Pooran drafted a beautiful plan of Triund hike along with exploring McLeod, Dharamkot and Bhagsu. 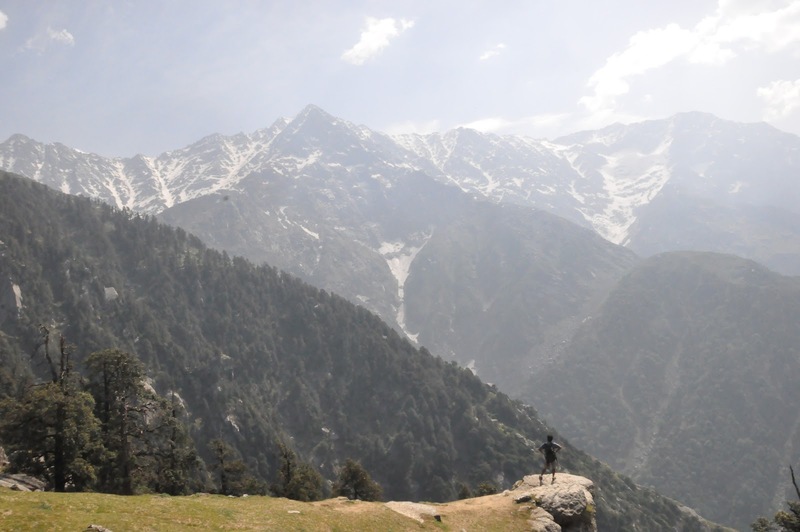 There was no way i could have asked for a better plan - The plan had a beautiful hike in the Dhauladhar mountain range ! 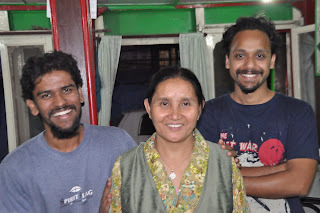 I flew in to Dharamshala from Delhi due to lack of time and Pooran, who was already in Delhi, took the bus. In the flight, I met a nice Canadian lady called Alice. 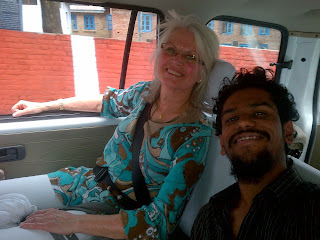 She knew more about India than me !! She practises Yoga regularly and has a Guru in McLeod. She shuttles between Canada and India most of the time. We discussed about our travels in India and Canada. As it turns out, I had seen more of North America than her ! One always tends to run away from home in search of 'exotic' places. We continued our discussion in the cab that we shared till McLeod. The first day was spent roaming around McLeod. We were just getting a feel of the town and its people. Very nice people - most of them of Tibetan origin. We had dinner at Gakyi restaurant. It is a very popular vegetarian Tibetan restaurant. The owner is just too good - she gave us the perfect menu item for our needs. For reasons unknown, McLeod has a lot of variety in desserts ! We found it a bit unusual for a town at 6000 ft. Later, when we enquired about the origin of these desserts, we were told that desserts cater to the needs of western audience. Now, that made sense since we were looking like tourists in our own country - this area has a lot of Westerners for various reasons. We tried the banana cake, carrot cake and host of other desserts. The ginger-lemon-honey tea too is a beauty - i have never tasted tea as good as this one... A must try if you ever happen to be in this place. 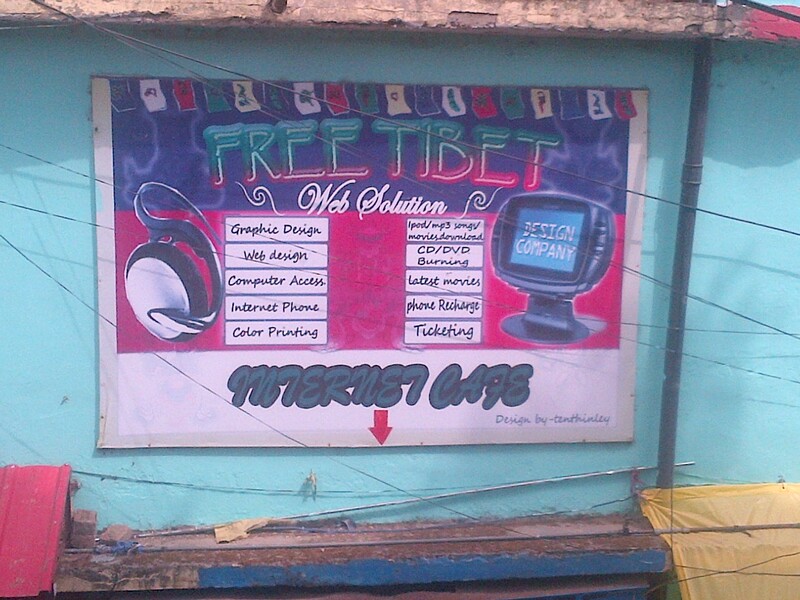 All three townships (McLeod, Dharamshala and Dharamkot) have a significant population of Tibetans. Most of them are second generation Tibetans. 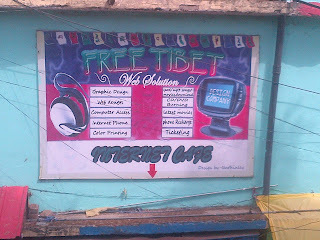 The theme of 'FREE TIBET' can be seen almost everywhere just like the internet cafe below. We started the hike at six. 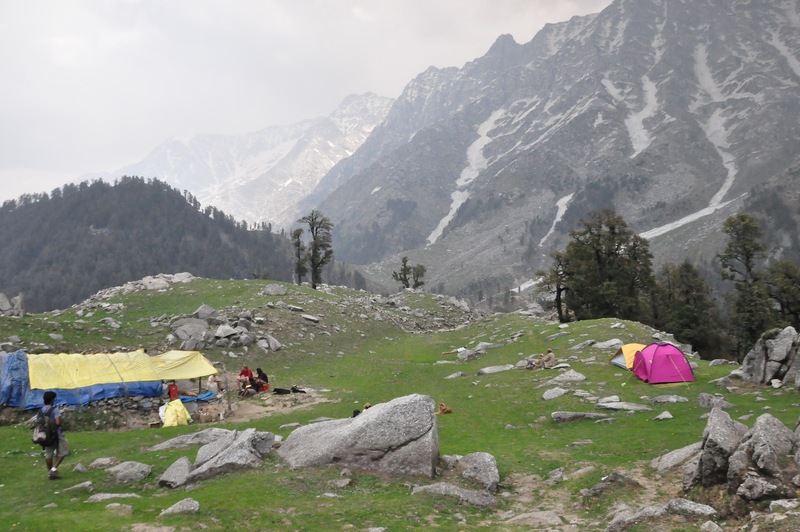 The trail to Triund (9300 ft) starts at Dharamkot and goes through Galu Devi temple. The trail has absolutely no markings but it is easy to follow because there are almost no diversions. The first tea shop is rough an hour and half away from the trailhead. 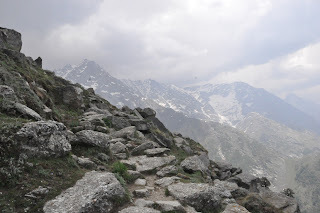 The trail is moderately sloped - reasonably easy till Triund. Some points on the way do offer good views. 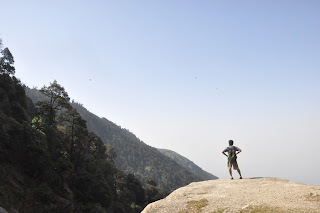 The summit of Triund offers excellent views of Moon's peak and other peaks of Dhauladhar Himalayan range. Time for some rest !! Our initial plan was to hike upto Triund and head back to McLeod. 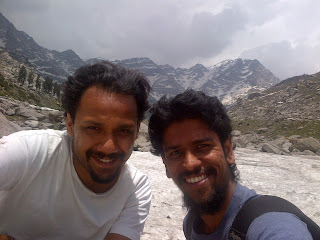 But, we reached Triund around 930 - after 3 hours of hiring. We had a full day in front of us - we decided to stretch ourselves to continue on to the base of Moon's peak, also called the snowline. 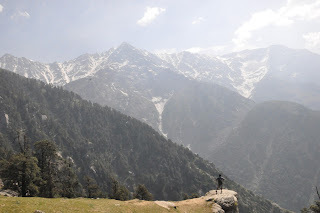 This was an additional 2-2.5 hrs from Triund. We took a couple of hours of break at Triund and then went on to snowline. We couldn't believe that we were actually at the base of Moon's peak which seemed to be really distant from summit of Triund. There was a cafeteria just before snowline - this guy stays up there (@ 11000 ft) for 9 months in a year. He made excellent Dal rice for us - much better than the Dal Rice in any of the cities. The cafeteria at 11000 ft !! We were indeed exhausted after 10hrs+ of hiking the whole day. We head back straight to our hotel to catch up with some sleep. The realization that this was our last day in the region was hard to bear. We walked till Bhagsu (abt 2kms from McLeod) - had a look at the waterfall from a distance and returned back immediately. The difference was clearly visible - On one hand, there was solitude and peace at snowline and on the other hand, Bhagsu was a tourist spot with a huge crowd. 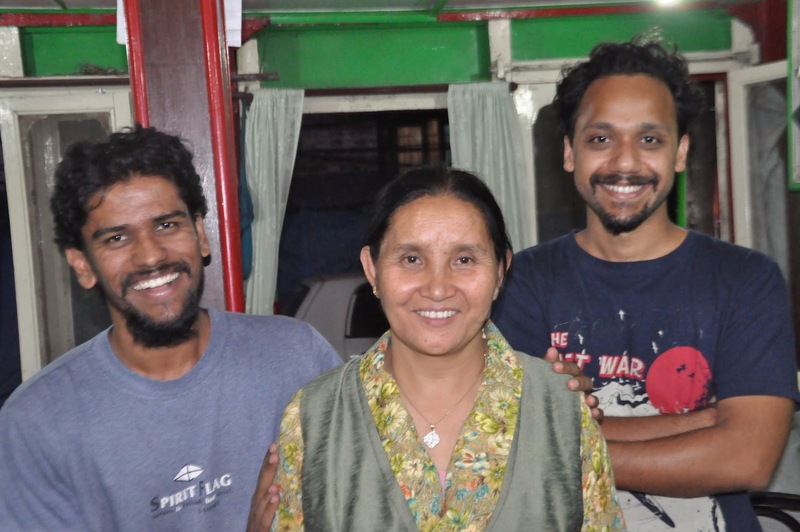 We didn't want to spend any more time at Bhagsu. All in all, a beautiful trip that included a wonderful hike, meeting some really nice people and exploring a new culture. Would certainly love to be back here in the mountains !! 2. Flight (Kingfisher has one flight that runs on select days of the week) 1.5 hrs - price varies as per demand. Dharamkot (Trailhead) to Galu Devi Temple - 45 mins - moderate slope - paved stone steps. Gakyi Veg Tibetan Restaurant - Highly recommended. Try their 'Special Muesli' for breakfast. Mineral water refill at Green Hotel @ Rs 10/liter - GO GREEN !